The champions of Earth assemble to defend the Sun from the appetite of an interstellar creature known as a sun eater. Booster Gold and BLUE BEETLE II are well out of their league when trying to combat a being that can consume the energy of the Sun. The crisis of the Final Night is one of the very last adventures of the EXTREME JUSTICE team before it disbanded. 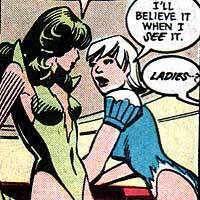 When the UNITED NATIONS withdrew support from the GLOBAL GUARDIANS in order to back the JUSTICE LEAGUE, Guardians Green Flame (Beatriz DaCosta) and Ice Maiden II (Tora Olafsdotter) switched teams to join the Justice League. They changed their codenames to Fire and Ice respectively before their powers were strengthened following the explosion of the Gene Bomb by the ALIEN ALLIANCE (see HEROES OF THE INVASION). Along with Booster Gold, BLUE BEETLE II, and the MARTIAN MANHUNTER, these two heroines formed the core of the Justice League for many years. As a result, Booster Gold has a long history and a strong personal relationship with both characters, especially the hot-tempered Brazilian beauty Fire with whom he has shared some very difficult times. With atomic-powered wings and heat blasts, Firehawk I (Lorraine Reilly) has long been a freelance adventurer and ally of FIRESTORM (Ronnie Raymond). Booster Gold and Firehawk first met while battling the ALIEN ALLIANCE together as HEROES OF THE INVASION. It would be many years later before they would develop a tempestuous relationship as partners in love and crime-fighting. Though the two are no longer a couple, their relationship apparently ended well enough that they still work together on occasion. Following the events of Flashpoint, a French Firehawk II began operating on behalf of the French government alongside Britain's Hurricane, crossing paths with Booster Gold and the new JUSTICE LEAGUE INTERNATIONAL in pursuit of rogue Firestorms. Firestorm is the codename taken by a number of heroes who have shared the Firestorm Matrix and the ability to transmute matter. Booster Gold first met Firestorm II (Ronnie Raymond/Mikhail Arkadin/Martin Stein) when both heroes were manipulated into working for the MANHUNTERS during the MILLENNIUM. Later, Booster would encounter both Firestorm IV (Martin Stein) and Firestorm V (Ronnie Raymond) simultaneously when an argument between the two (who collectively were the original Firestorm I) threatened the city of Pittsburgh. When Firestorm V joined the EXTREME JUSTICE team, Booster grew to resent Raymond's vitality and popularity. After Ronnie Raymond's death, Booster would eventually meet Raymond's successor, Jason Rusch, as Firestorm VI. 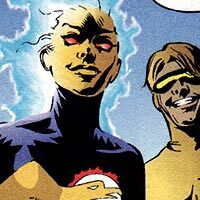 (Unlike previous Firestorms, Rusch is the dominant force in his Firestorm Matrix, and consumes other personalities rather than co-exist with them.) 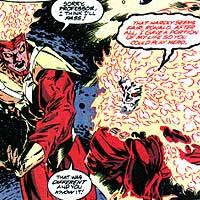 After the events of Flashpoint, Rusch can create unique and more powerful forms, such as Wrath, when joining with other Firestorms. Over the years some heroes have learned to tap into the Speed Force, an energy that allows for vastly increased movement. 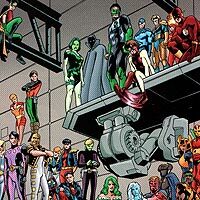 Many of these heroes have adopted the public identity of the Flash out of respect for their forebearers, though some others have chosen other names, such as JUSTICE SOCIETY OF AMERICA members Johnny Quick and Jesse Quick or "speed guru" Max Mercury. 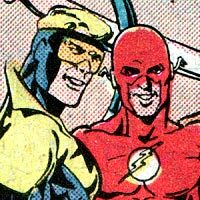 The first speedster that Booster Gold encountered was Flash II (Wally West) as a member of the HEROES OF THE MILLENNIUM event. He would later encounter West's mother, Mary West, and wife, Linda Park. 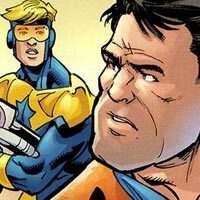 During a trip through time, Booster would even encounter West as a young man in his original guise of Kid Flash, which he used as a member of the original TEEN TITANS. Given his long history with the Flash family, it was to be expected that Booster cross paths with the greatest threat to the Flashes, Professor Zoom, the original Reverse Flash. Like Booster, Zoom also happens to be a time-traveler from the 25th century. Zoom is personally responsible for some terrible crimes against history, including instigating the "Flashpoint" that rewrote the timeline of the DC Universe. Booster has at various times also crossed paths with other members of the Flash's extensive ROGUES GALLERY and other recurring Flash villains, including the android Samuroids. Fred Flintstone is a caveman living in the town of Bedrock in the year 20,000 B.C. The rest of his "modern stone age family" include his wife Wilma, daughter Pebbles, and pet dinosaur Dino. Fred's neighbors are Barney Rubble, his wife Betty, and their son Bamm-Bamm. Other characters in Bedrock include scientist Professor Sargon. 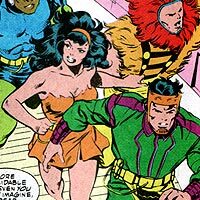 The Forever People are composed of several young NEW GODS who seek to oppose DARKSEID through their relationship with the powerful Infinity Man. Booster Gold fought alongside the Forever People as members of Superman's assembled HEROES OF THE PANIC IN THE SKY to stop BRAINIAC from using Warworld against Earth.